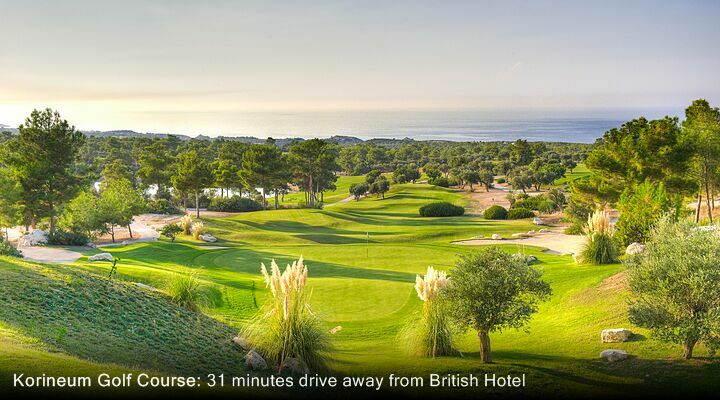 7 Nights from £359 inc Flights, Hotel & VIP Transfers - £172 OFF! 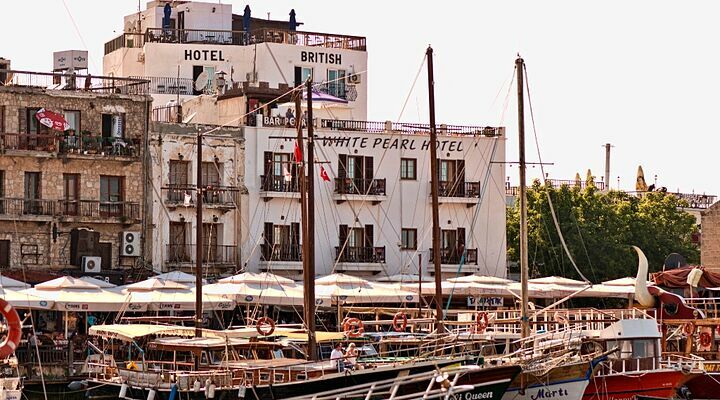 The British Hotel is the best boutique hotel in the Kyrenia Harbour area, with a friendly welcome and an unbeatable location. 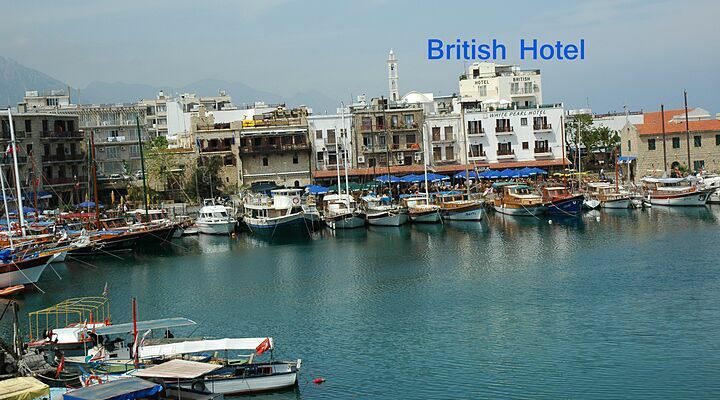 At GNC, we highly recommend The British Hotel for those who want to be right in the centre of Kyrenia, staying in a hotel with genuine character. 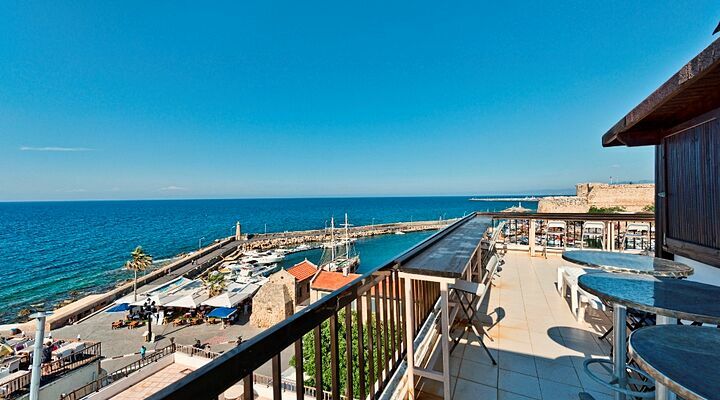 The British Hotel is the pick of the crop of Kyrenia harbour hotels, with views straight across the harbour to the sea beyond, and up to the mountains behind the town. 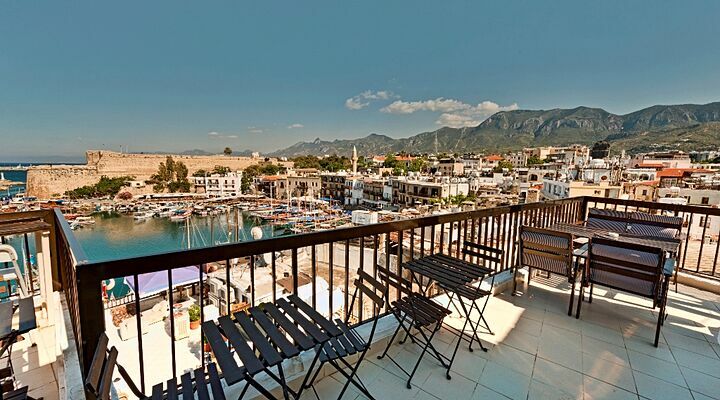 With clean, tidy rooms all with en suite bathroom, this is a quaint, traditional 3 star hotel in Kyrenia where everything is literally on your doorstep. 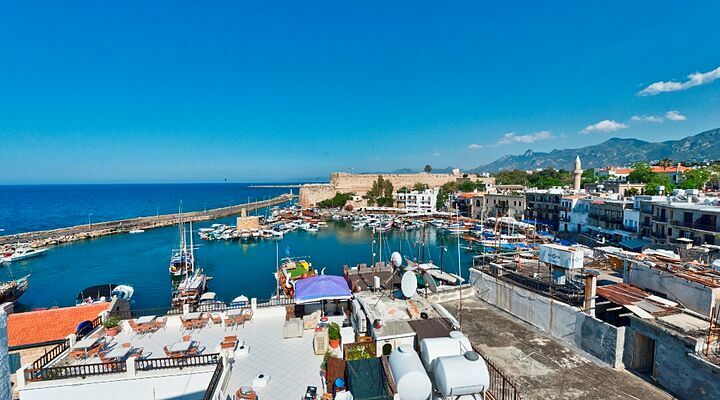 Most tourists who come to Kyrenia enjoy the quaint harbour area, with Kyrenia Castle dating back to venetian times as your backdrop. 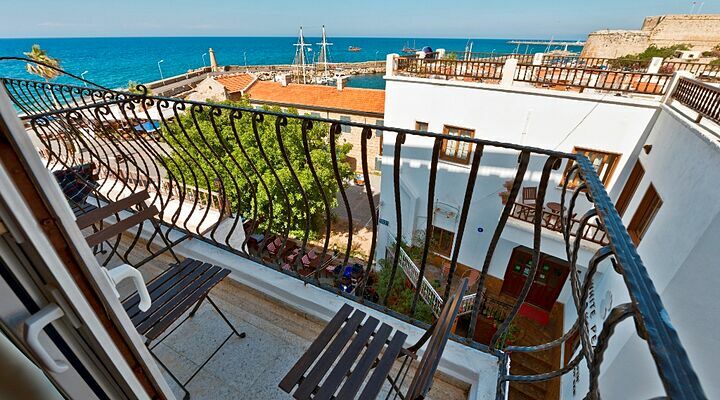 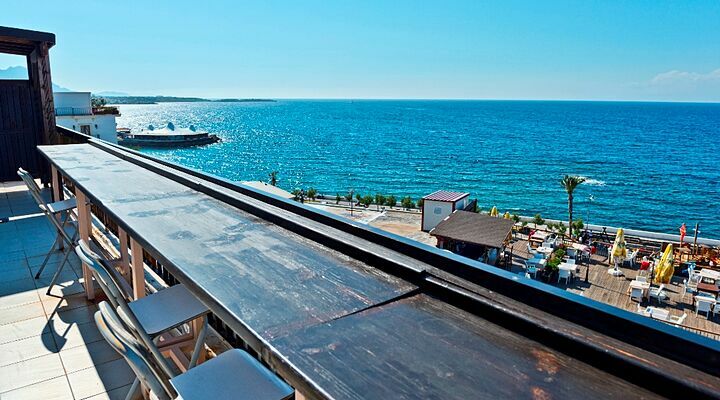 Start the day with breakfast on the hotel roof terrace overlooking the fishing boats bobbing in the harbour. 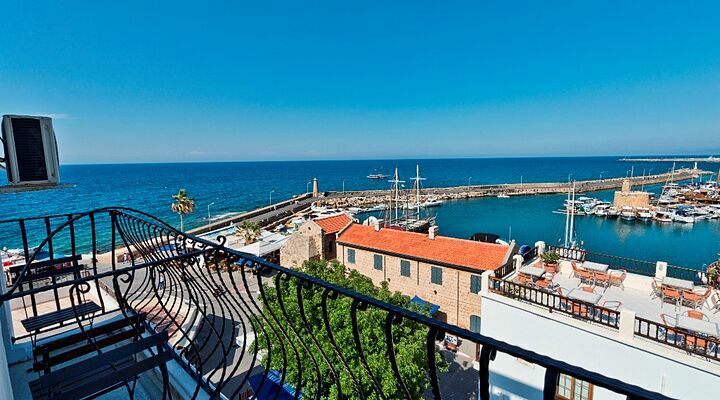 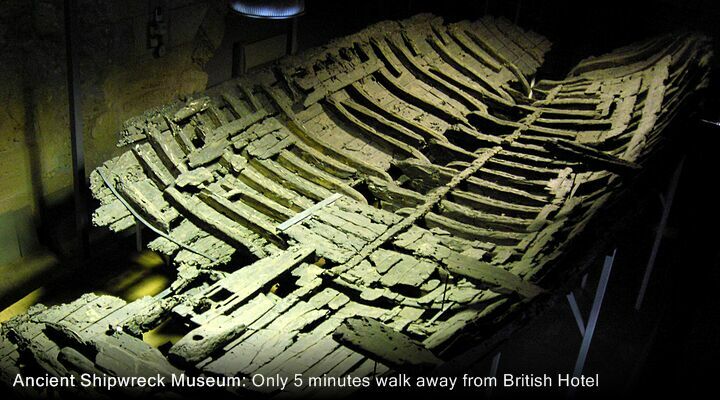 A boat trip is a must during your stay. 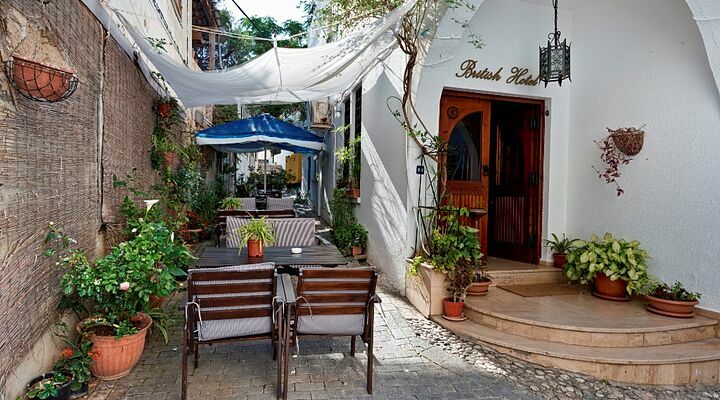 Step out of the hotel's front door and you're just metres away from a morning coffee and baklava, a tasty lunch, or a delicious dinner. 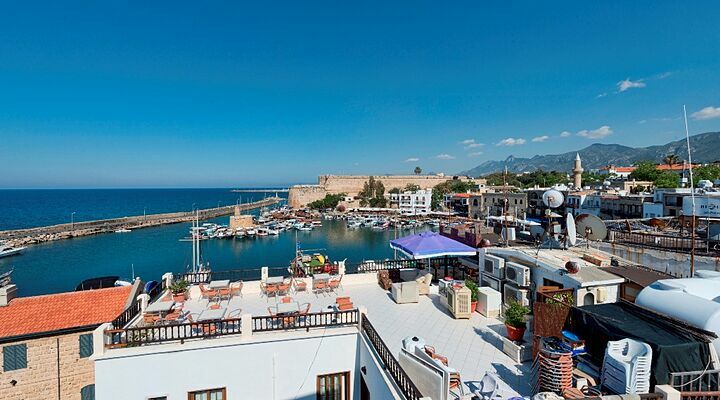 Kyrenia's shops, craft galleries and hidden museums are there for you to explore in the winding medieval streets. 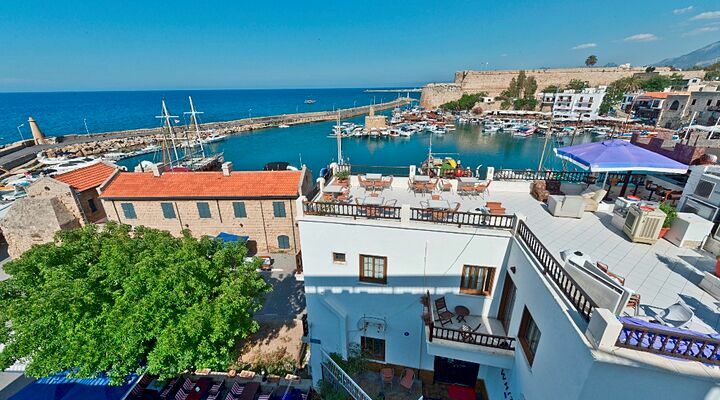 Best of all, you can take in the history of Kyrenia Castle and explore this mighty fortress. 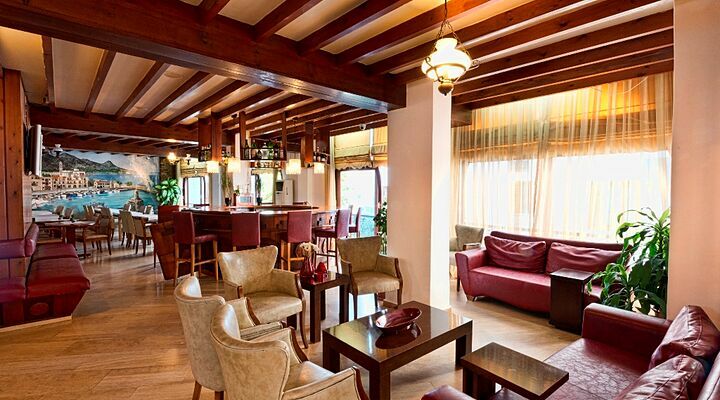 Cool off in one of the many rooms within the castle walls. 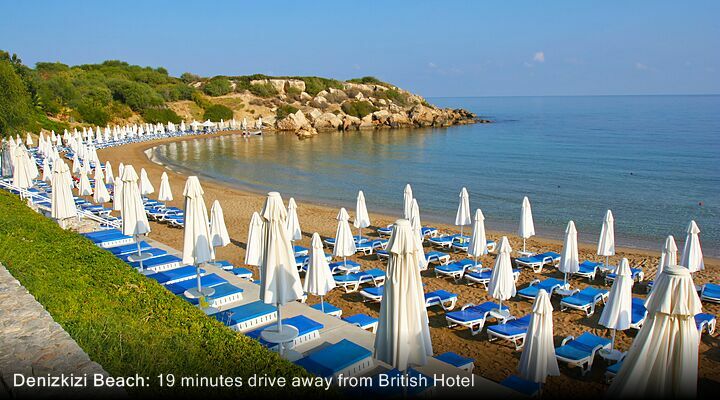 Book your next holiday at the British Hotel with Go North Cyprus. 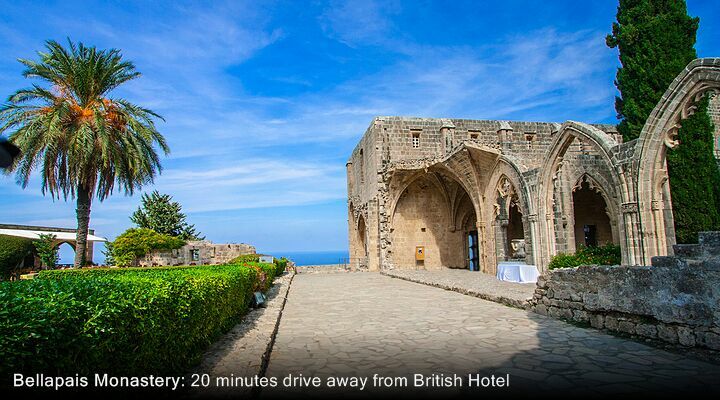 We've been in business over 14 years, and our team is based in Northern Cyprus, so we really know our hotels here. 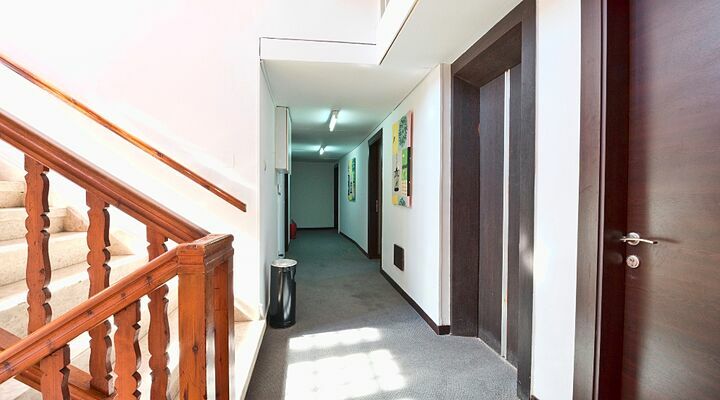 Call us and pick our brains on 0800 612 6600 - we're always happy to help. 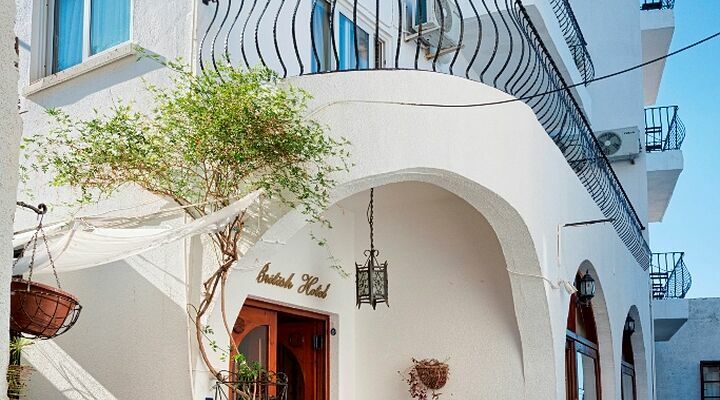 The British Hotel is a traditional 'home from home' style hotel with eighteen rooms over four floor, all served by a lift, and all with en-suite bathroom. 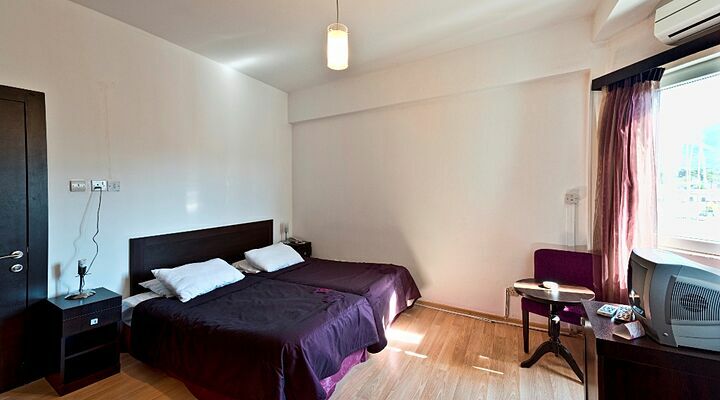 Rooms are surprisingly contemporary in decor with feature wall wallpapers, and rich purple fabrics. 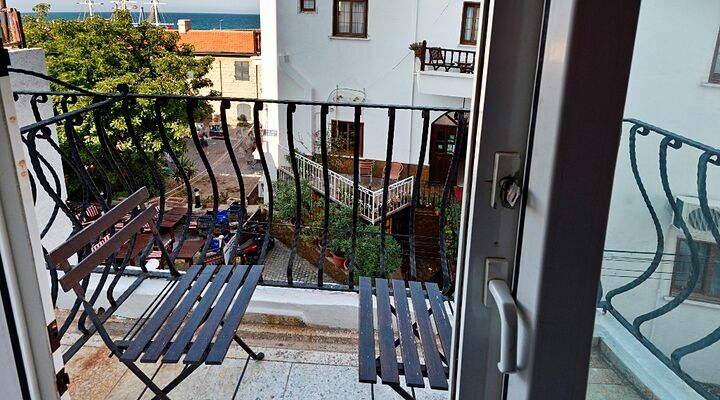 Second and third floor rooms have a balcony or terrace, and the third floor rooms enjoy super views over the harbour or mountains. 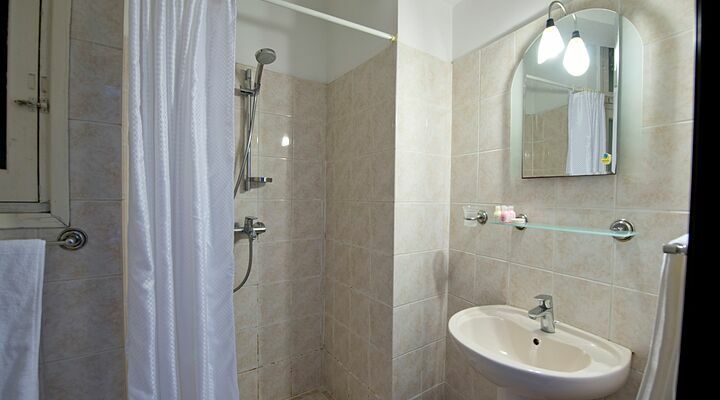 All rooms have air conditioning, satellite tv and a mini bar. 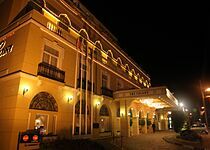 When you arrive at the British Hotel, owner Hamza will usually greet you - and then make sure everything is to your satisfaction. 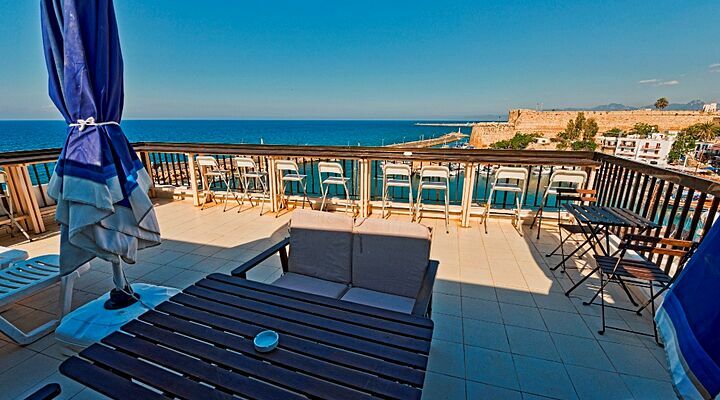 This level of genuine service extends across the whole hotel, from the hotel barman to the waiter who serves breakfast on the roof terrace in the sunshine. 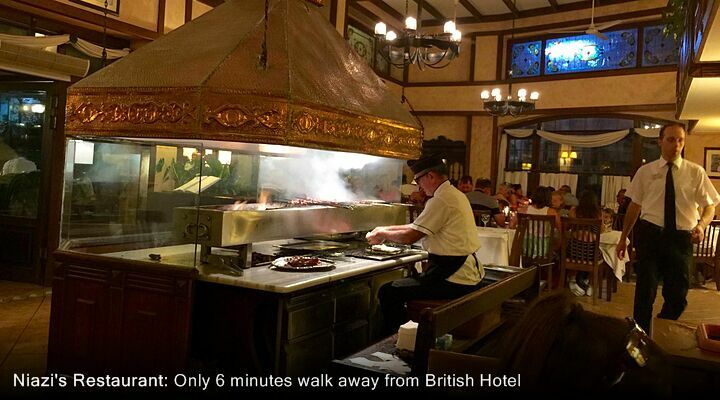 There's no rush for breakfast either; it's served until 11am, so you can sleep in and not miss out on your morning coffee, eggs and toast! 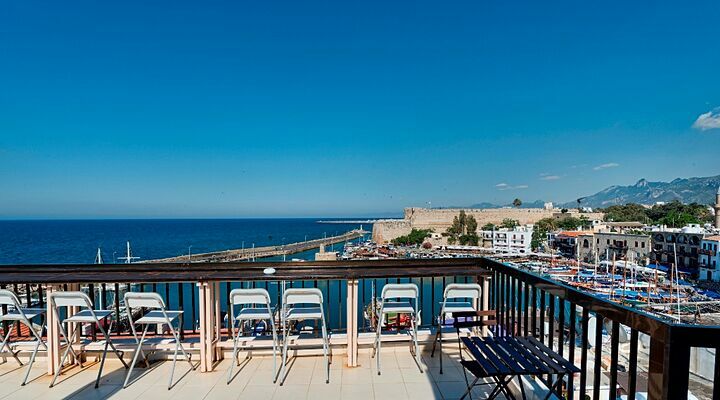 The lobby area has WiFi available, so you can post pictures of that amazing view from your room and make all your friends envious, especially if you tell them about the special rates you got from Go North Cyprus (more below). 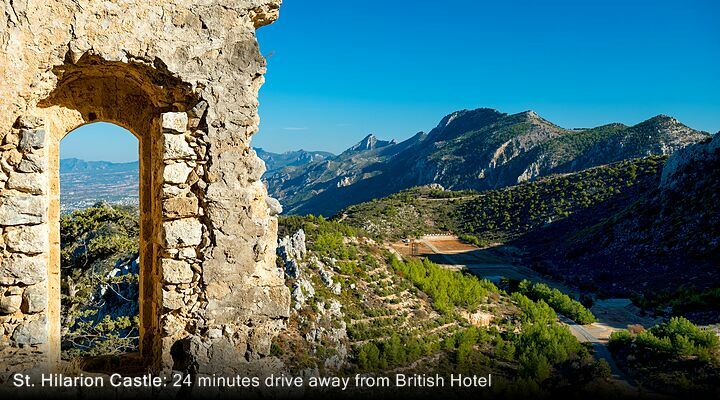 We like the British Hotel a lot, and that's why we've negotiated special rates for GNC customers direct with the hotel owner. 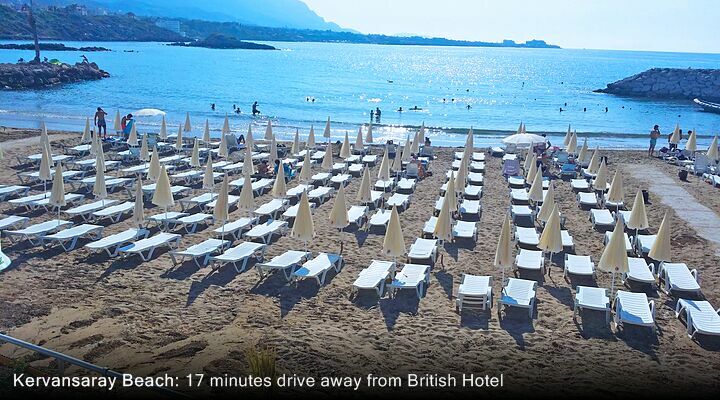 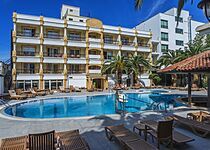 So, when you book a stay at the British Hotel with us, you can enjoy great hospitality, a superb location and unbeatable prices on your next North Cyprus holiday or short break. 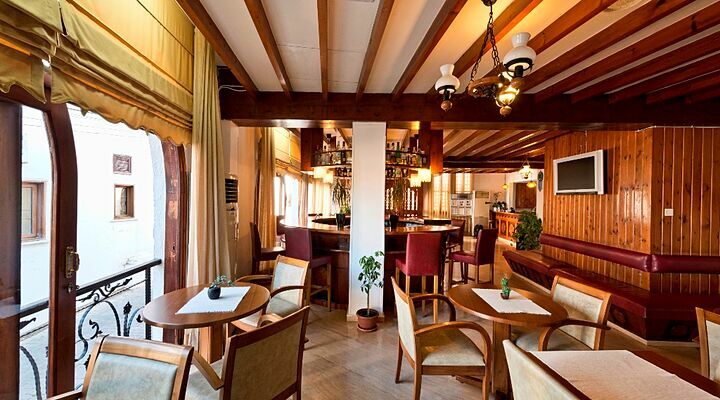 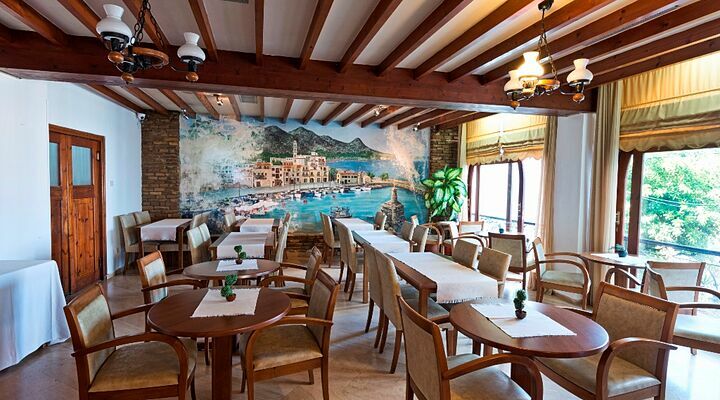 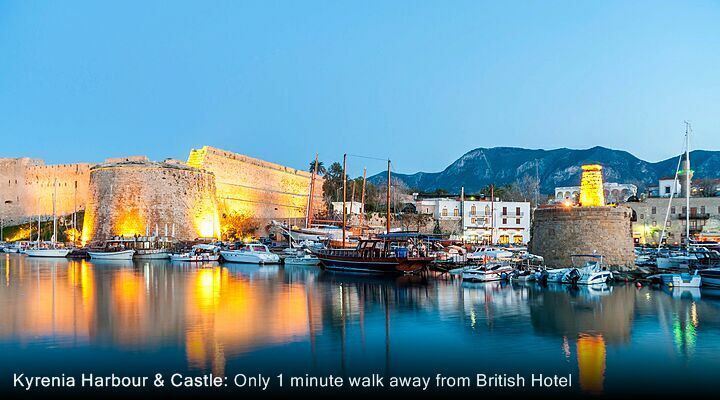 At the British Hotel, every part of Kyrenia is within walking distance, and that includes excursions and activities. 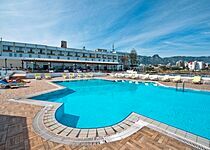 Most scenic boat trips, fishing trips and scuba diving excursions start from the harbour, so you can walk down and join your trip. 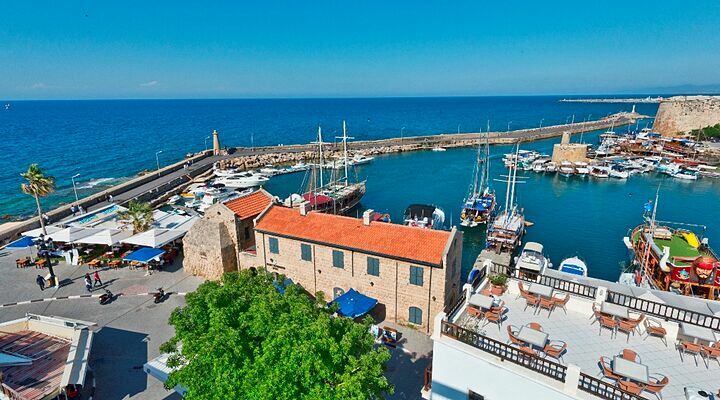 Equally, walk to any of the major pickup points for inland excursions including day trips to Nicosia, paragliding in the mountains, exploring the Crusader castles or even 4x4 safaris in the Karpas Peninsula. 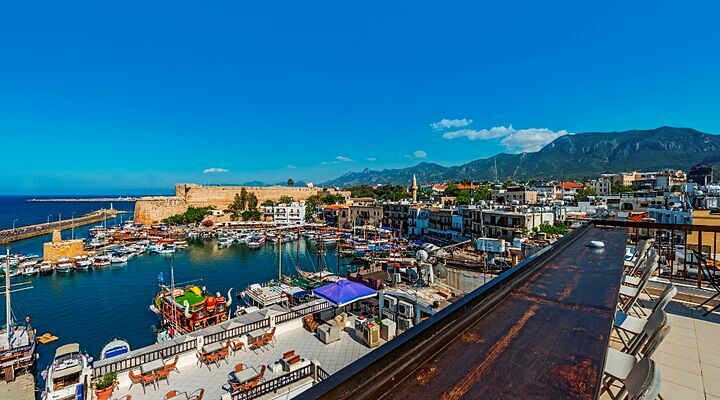 Best of all, you can walk to local restaurants and bars, visit a local beach, or have a flutter at a top Kyrenia casino and not need a taxi home afterwards! 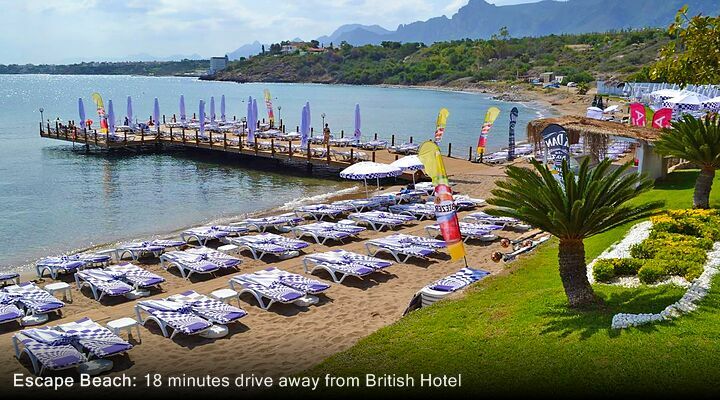 Thanks to the new road through the mountains from Ercan Airport to Kyrenia, transfer times are quick and easy. 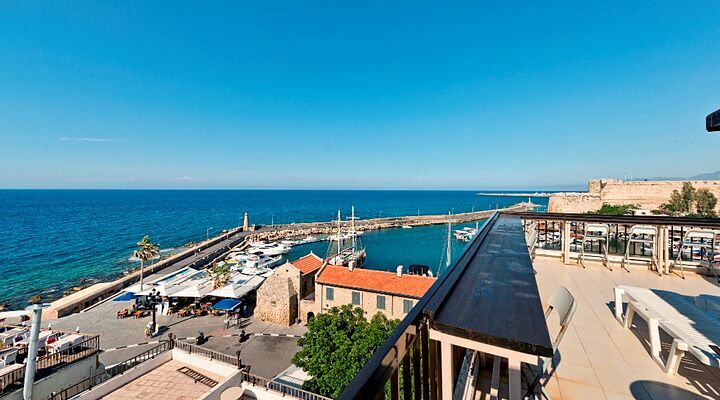 An airport taxi transfer can get you right to the front door as they are allowed on the harbourside. 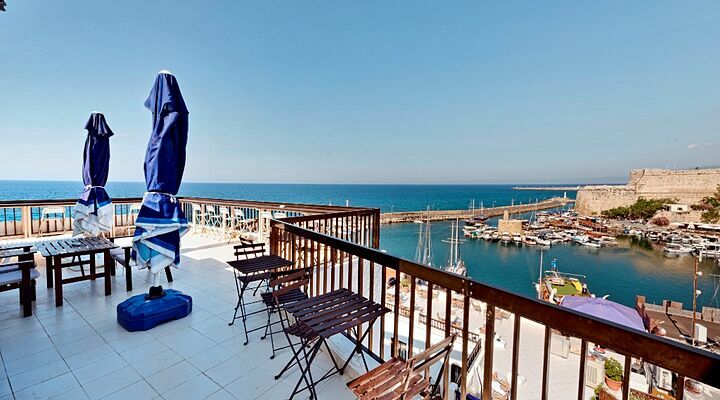 If you want to hire a car for a few of days, there is a public car park close by.